Learning how to roast cashews at home is pretty similar to a lot of other nuts and it doesn't take a world class chef to master the art. Cashews are frequently found in health food stores and supermarkets, strategically positioned among nuts and pistachios. The tree was originally found in Brazil but now it is farmed in numerous tropical countries. Cashews taste great and contain a plethora of healthy nutrients such as protein and good fats. Most people enjoy them two or three times a week and reap all their nutritional benefits. They can be eaten raw or roasted to bring up the flavor. Roasting your own cashews is an easy process and it can be done in as little as 15 minutes. Keep reading to find out exactly what you have to do enjoy delicious roasted cashews at home. It doesn't take long and creates a mouth watering smell in your kitchen! Cashews are easy to roast, but you must be careful not to burn them. Start by preheating the oven at a temperature of 300 degrees Fahrenheit. You can roast them in a large tray or a cake pan if you are preparing a small batch. It is important to avoid stacking them on top of each other because this causes an uneven roasting process. If you want to prepare a larger batch, you can use multiple trays and repeat the roasting process several times. In most cases, cashews will not stick to the bottom of the tray, but to be absolutely sure, you can use parchment paper while roasting them. Cashews can be roasted dry or by adding a spoonful of cooking oil. You can use olive oil, sesame oil, and other varieties. Adding oil is not absolutely necessary, but it helps to bring up the flavor and texture of your cashews. You can also add cooking oil later if necessary. Roast the cashews for five minutes on each side. The total cooking process shouldn't be longer than 10-15 minutes, otherwise, your cashews will get burnt. Note: everyones oven is slightly different so please keep on a eye on them. Check every 5 minutes. Make sure they are not becoming to dark, anymore than a light brown and they are becoming over-cooked. Supervise the roasting process closely and let them cook for 5-7 minutes on each side. If you're using a cake pan, you can toss them from time to time to ensure they are cooking evenly. When you get that appetizing, delicious smell while cooking, it means they are almost ready. 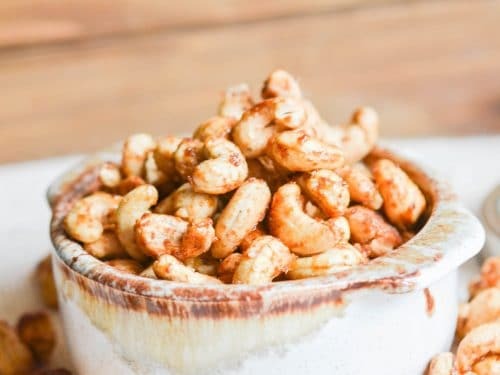 Add salt or spices to really lift the flavor After you have roasted your cashews for about 10-15 minutes, take out the tray from the oven and sprinkle more cooking oil or salt, paprika, and even sugar. These spices can be added depending on your preferences, but don’t overdo it because they can alter the flavor of the cashews. Some cooks also use cayenne, cinnamon, and clovers to season their cashews. Cashews are best served when they are cool, so wait up to 30 minutes for them to get to room temperature before serving. When they are cooling, make sure you transfer them to a separate plate, otherwise, the hot roasting tray might burn your cashews. You can eat them as snacks or in combination with other food. If you decide to eat them later, your cashews should be transferred in a plastic food container and preserved in a dark, cool place. Roasted cashews should be eaten in two weeks or less. Enjoy!